Download "植物防疫所調査研究報告 ( 植防研報 ) 第 51 号 : 1~6 平成 27 年 (2015) 原 著 ポスピウイロイド属 8 種の RT-PCR 法を用いた検出法の開発 柳澤広宣 志岐悠介 横浜植物防疫所 Development of RT-PCR Assay Method for Detect"
2 2 植物防疫所調査研究報告第 51 号 材料及び方法 1. 供試ウイロイド及び供試植物供試ウイロイドとして PSTVd 4 株 TCDVd 1 株 Chrysanthemum stunt viroid (CSVd) 1 株 Citrus exocortis viroid (CEVd) 1 株の他 日本国内で発生報告の無い Tomato planta macho viroid (TPMVd) 1 株 TASVd 1 株 Columnea latent viroid (CLVd) 1 株 PCFVd 1 株について農林水産大臣の許可を取得し使用した (Table 1) 各々ウイロイドに単独感染したトマト葉を 0.1Mリン酸緩衝 (ph7.0) で磨砕し 粗汁液をトマト ( 品種 :Rutgers) の子葉に接種し に調整した温室内で管理を行い 感染植物を作製した 接種植物は 接種 3 週間後にポスピウイロイド属のユニバーサルプライマー Pospi1-FW/RE CLVdを検出するプライマー Vid-FW/RE (Verhoeven et al.,2004) 並びに PCFVd を検出するプライマー AP-FW1/RE2 (Verhoeven et al., 2009) を用いて RT-PCRを行い 感染を確認した また PSTVd 及び TASVdについては 感染を確認したトマトに着果した果実から感染種子を採取し 種子表面を滅菌水で洗浄 室温にて風乾後 4 で保管した Table 1. List of pospiviroids, DDBJ accession numbers and the origin in this study Viroid DDBJ a accession No. Origin PSTVd-M - Canada (from R. P. Singh) PSTVd-S - Canada (from R. P. Singh) PSTVd-F EU Fukushima Prefecture in Japan PSTVd-D AB Yamanashi Prefecture in Japan TCDVd AB Hiroshima Prefecture in Japan CEVd AB in Japan CSVd - in Japan PCFVd HQ Thailand (from Reanwarakorn) CLVd AY Netherlands (from Verhoeven J.T.J. ) TPMVd GQ Netherlands (from Verhoeven J.T.J. ) TASVd AM Netherlands (from Verhoeven J.T.J. ) a: DNA data bank of Japan ( 2. スクリーニング検定用プライマー及び植物内在性コントール用プライマーの選定及び条件設定既報のポスピウイロイド属のユニバーサルプライマーとして Pospiviroid-For/Rev 及び Pospi1-FW/RE があるが 新たに Pospi-F2(5 - TCCTGTGGTTCACACCTGACC -3 )/ R2(5 - TTCAGTTGTTTCCACCGGGTAG -3 ) プライマー ( 増幅サイズ :PSTVd の場合 261bp) を設計し 計 3 組のプライマーについて 上記 8 種のウイロイドが 検出可能か試験を行った また 植物組織から核酸が抽出されたことを確認するための植物内在性コントロールプライマーを 植物体の核酸配列のうち NADH dehydrogenase subunit Ⅱをコードする領域に対応する mrna 上に設計した (nad2 RT2-F(5 - CGCTGTAGGATCCCTATTCAAGA-3 ) 及び R(5 - TGGGTGAACCCTCATAGATATCAG-3 )( 増幅サイズ :80bp) 各ウイロイド感染トマト葉からの核酸抽出は RNeasy Plant Mini Kit (QIAGEN 社 ) を用い 付属マニュアルに従い行った RT-PCRは 省力化を図るため OneStep RT-PCR Kit (QIAGEN 社 ) を用い 付属マニュアルに従い反応液の調製を行った RT-PCR にはVerti サーマルサクラー (Applied Biosystems) を用い 反応条件は 分 分の後 秒 秒 72 1 分で 40サイクル行い 72 7 分後 4 で維持した 増幅産物は 2% アガロースゲル及び1 TAE を用いて電気泳動後 ゲルをエチジウムブロマイドで染色した 3. 種特異的プライマーの設計及び条件設定並びに検出感度比較供試した各ウイロイドの種特異的プライマーを新たに設計し (Table 2) OneStep RT-PCR Kitを用い反応液の調製を行った RT-PCRの反応条件は 分 分の後 秒 秒 秒で 40サイクル行い 72 7 分後 4 で維持した また スクリーニング検定用プライマーと各ウイロイドの種特異的プライマーの検出感度を比較した 検出感度 Table 2. 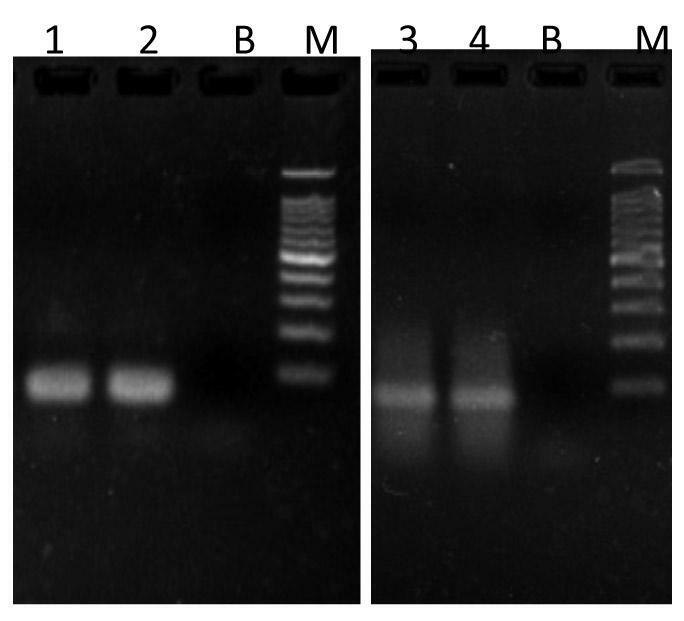 Newly designed specific primer which detects each of eight pospiviroids in this study The species Primer name Primer sequence (5'- -3') Amplicon size (bp) PSTVd PSTVd-spe-5F CGTGGTTCCTGTGGTTCACACC PSTVd-spe-5R TGCGGGCGCGAGGAA 207 TCDVd TCDVd-spe-NP3 CAGGGAGCTTGTGGAAGGC TCDVd-spe-NP4 TCTCGGGAGCTTCAGTTG TT 161 CEVd Pospiviroid-For ATTAATCCCCGGGGAAACCTGGAG CEVd-spe-R GCGACGATCGGATGTGGAG 139 CLVd CLVd-spe-F2 GAGAGCGCAAGAGCGGTCT CLVd-spe-R GTCAGMACCTGCGCTGG 186 TASVd TASVd-spe-F1 TGACCCTGCAGGCATCAAGA Pospiviroid-Rev AGCTTCAGTTGTTTCCACCGGGT 245 PCFVd PCFVd-spe-F2 CGGCCGGGAGTGAAGCTAC Pospiviroid-Rev AGCTTCAGTTGTTTCCACCGGGT 302 CSVd CSVd-spe-F1 CGGCTGGGGCTTAGGACC Pospiviroid-Rev AGCTTCAGTTGTTTCCACCGGGT 158 TPMVd TPMVd-spe-F GGAGCGAACTGGCGAAGGAG TPMVd-spe-R CGGGCGAGGGTGTCGAC 125 Forward or revese primer of Pospiviroid-For/Rev (Bostan et al., 2004) was used in the specific primer of CEVd, TASVd, PCFVd and CSVd. 6 6 植物防疫所調査研究報告第 51 号 system for Potato spndle tuber viroid and Tomato chlorotic dwarf viroid. Eur. J. Plant Patho. 128(2): Nakahara, K., T. Hataya, Y. Hayashi, T. Sugimoto, I. Kimura and E. Shikata (1998) A mixture of synthetic oligonucleotide probes labeled with biotin for the sensitive detection of potato spindle tuber viroid. Journal of Virological Methods. 71: Shiraishi, T., K. Maejima, K. Komatsu, M. Hashimoto, Y. Okano, Y. Kitazawa, Y. Yamaji, S. Namba (2013) First report of tomato chlorotic dwarfviroid from symptomless petunia plants (Petunia spp.) in Japan. Journal of general plant pathology. 79(3): 214. Singh, R. P., A. D. Dilworth (2009) Tomato chlorotic dwarf viroid in the ornamental plant Vinca minor and its transmission through tomato seed. Eur. J. Plant Patho. 123: Singh, R. P., K. F. M. Ready and X. Nie (2004) Viroids [ Hadidi, A. et al.] CSIRO Publishing, Colloingwood, Australia: Tsushima, T., S. Murakami, H. Ito, Y.-H. 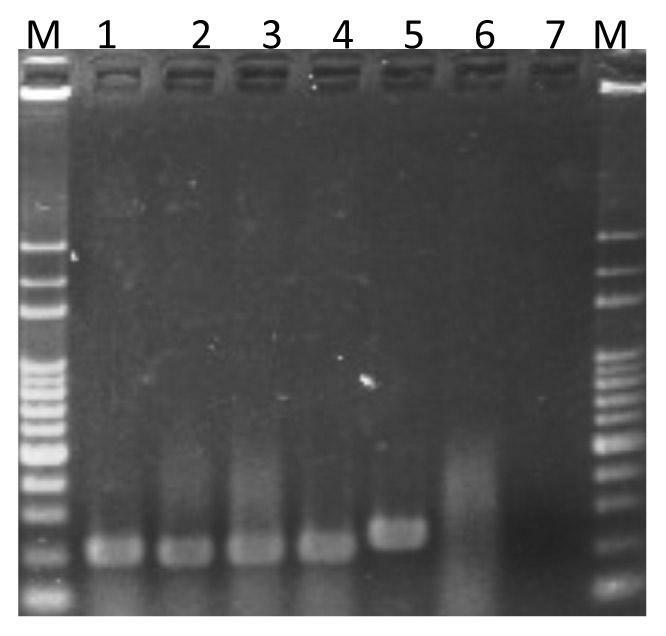 He, Raj, A. P. C. and T. Sano (2011) Molecular characterization of Potato spindle tuber viroid in dahlia. Journal of general plant pathology. 77: Tsutsumi, N., H. Yanagisawa, Y. Fujiwara, T. Ohara (2010) Detection of Potato Spindle Tuber Viroid by Reverse Transcription Loop-mediated Isothermal Amplification. Res. Bull. Pl. Prot. 46: Verhoeven, J. T. J., C. C. C. Jansen, J. W. Roenhort. (2007) Streptsolen jamesonii Yellow, a new host plant of Potato spindle tuber viroid. New Disease Reports 15: 40. 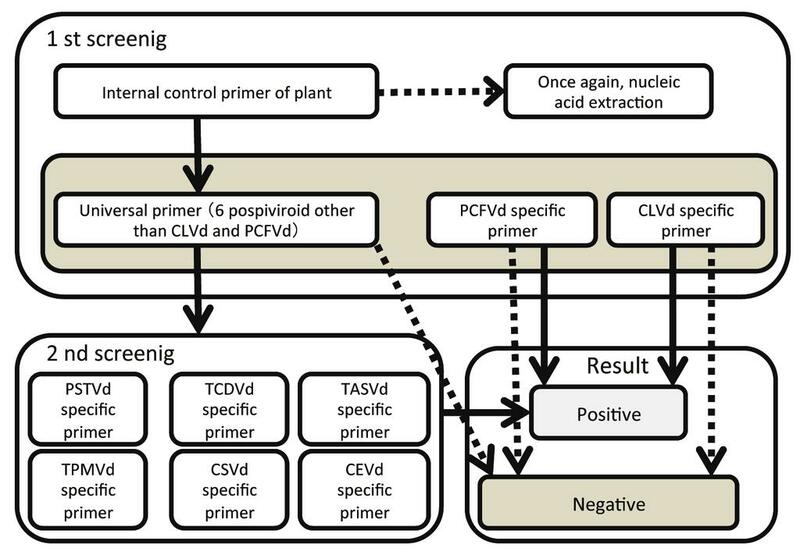 Verhoeven, J. T. J., C. C. C. Jansen, J. W. Roenhorst, R. Flores, M. de, la Peña (2009) Pepper chat fruit viroid: biological and molecular properties of a proposed new species of the genus Pospiviroid. Virus Research. 144: Verhoeven, J. T. J., C. C. C. Jansen, T. M. Willemen, L. F. F. Kox, R. A. Owens, J. W. Roenhorst (2004) Natural infections of tomato by Citrus exocortis viroid, Columnea latent viroid, Potato spindle tuber viroid and Tomato chlorotic dwarf viroid. European Journal of Plant Pathology. 110: 柳澤広宣 堤直也 石井一考 志岐悠介 栗原金光 (2012) RT-LAMP 法を用いた Potato spindle tuber viroid 検出法の改良. 植防研報 48: 7-12.